It is a startling image: an Inuit hunter pulls a Greenland dog-sled with standard-bred poodles along the Seine River in the heart of Paris, France. This art project, L’arctique est Paris, combines interactive art, film, and presentation. It is one of many ArtCOP 21 efforts to “expand the conversation” and draw attention to climate in unique, emotive ways. Gretel Ehrlich, author of the Harpers article Rotten Ice: Travelling by Dogsled in the Melting Arctic, explained how we desperately need imagination to remind us of the danger climate disruption is posing to all living beings and their cultural diversities. “What happens in the Arctic happens to all of us because the Arctic drives the climate of the world,” Ehrlich said. To bring the reality of the project into the minds of attendees, the artists organized Jens Danielsen and Mamarut Kristiansen, elite hunters from the northernmost town in Greenland, to come share their stories of adaptation. 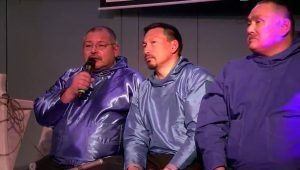 Danielsen is the mayor of Qaanaaq, and a delegate to the Inuit Circumpolar Conference. Jens Danielsen and Mamarut Kristiansen, hunters from Greenland. Danielsen is also the mayor of Qaanaaq. They were introduced by Nobel Laureate Dr. Berrien Moore, lead author of the 2001 IPCC report on climate change. He explained that even in a “best case” COP21 negotiation scenario we must recognize places like small island states and the Arctic are in trouble with the CO2 already in the atmosphere. The science is showing there is absolutely no doubt Greenland is melting, he explained. 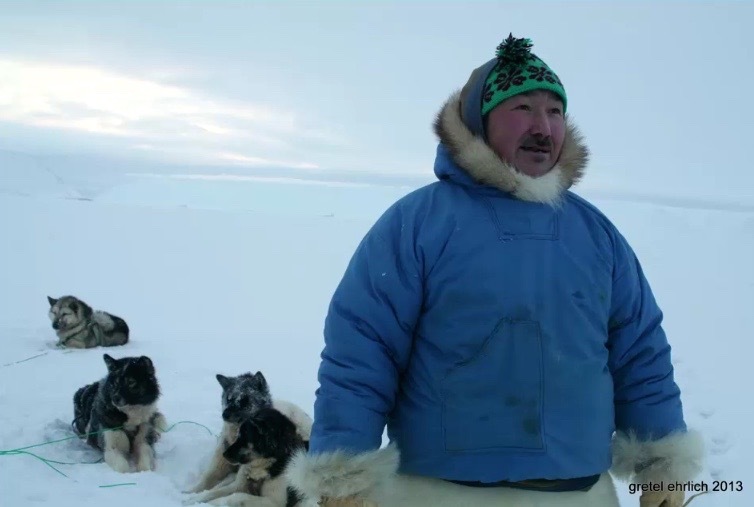 Inuit people like Danielsen and Kristiansen are part of a continuous culture of 20,000 years. As they lose their traditional ways of life like hunting to unimaginably rapid sea-ice changes, the world is losing a part of its heritage. The two hunters described, alongside a translator, increases in storms and changing seasonal patterns that render the formerly predictable, unpredictable. Their traditional knowledge can no longer read the signs. 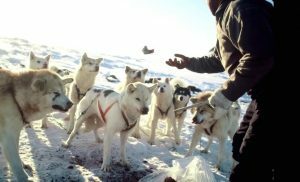 Ancient ice trails are disappearing and the lack of snow cover on the ice is affecting their sled-dogs’ paws. As the hunting season is dramatically cut short, their wives make fewer hunting clothes. The cycle of cultural decline is continuous. The hunters explained that they are adapting, as their people always have. More fish are present in areas where there weren’t previously, so they fish more. There are ways to adapt. “Scientists they come and tell us what is happening … but we are the ones who are seeing the changes and also living under the changes,” Danielsen said. At La Gaîté lyrique venue in Paris, amidst fancy cafes and art exhibits, metropolitan city-dwellers had a sense of what this close-yet-far lived experience was like. Image by Gretel Ehrlich for L’arctique est Paris.